Are you struggling with your lack of piano skills? Are you ever embarrassed when you are unable to play for your students? Do you feel inferior to singers who can play piano? Have you taken piano lessons in the past and found that the process is slow, frustrating and difficult? What if I told you that there is an easier way? Hi! 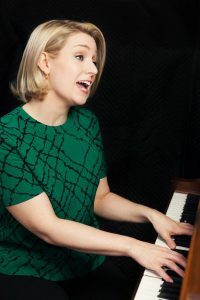 I’m Brenda Earle Stokes and I help busy singers and voice teachers achieve greater confidence and ease at the piano in just 20 minutes a day, so they can experience freedom in their teaching without feeling overwhelmed and investing time in expensive private lessons. My first instrument and both of my college degrees are in piano, and I always my facility on the piano for granted. Over the years, more and more singers and voice teachers have come to my private studio, frustrated and embaressed by their lack of piano skills. I have developed a clear and concise method of curated skills that every singer needs, which are broken down into easy and manageable steps. Gain more confidence and freedom at the piano in the most direct and cost effective way possible! 30 day money back guarantee backed by the Teachable platform. Perfect for people new to the piano and those who need to brush up their skills. Perfect for anyone with some piano background. Both courses are jam packed with tips and advice on technique, organizing your practicing and how to master the material in the fastest way possible. When you enroll in the course, you gain access to a private Facebook Members forum, where you will get additional bonus material which you connect with other course participants and get personal access with the course creator. For one purchase price, you get lifetime 24/7 access to the course, so you can learn at your own pace, in the comfort of your own home.